Ridge Pike is owned by Montgomery County between Norristown and Philadelphia. The Harmon Road to Crescent Avenue section of the Ridge Pike Improvement Project is primarily a residential corridor with some businesses and private/public open space. 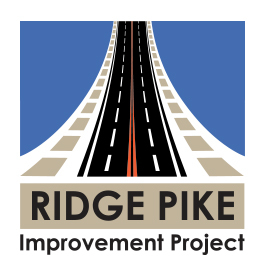 The lead design engineer for Segment C of the Ridge Pike Improvement project, RK&K, is a firm that has been providing multi-discipline planning, engineering, environmental and construction services since 1923. For more information, visit www.rkk.com. RK&K is also supported by a team of subconsultants, including Boles Smyth, A.D. Marble, Malick & Scherer, P.C., and InfraMap Corp. This project includes the reconstruction of approximately 2.1 miles of Ridge Pike from Harmon Road to Crescent Avenue and is located primarily within Whitemarsh Township with the western limit at Harmon Road in Plymouth Township. This is one of several segments comprising the overall Ridge Pike Improvement Project proposed by Montgomery County. Presently, there are two travel lanes in both the eastbound and westbound directions of Ridge Pike, except at Joshua Road where one eastbound through lane is currently used as an exclusive left turn lane There are four existing signalized intersections (Butler Pike, Spring Mill Road, Joshua Road and Chestnut Street/South Gilinger Road) in this section of Ridge Pike. In addition, there are some sections of existing sidewalk, but no continuous sidewalk throughout the entire corridor. Several SEPTA bus stops are also located along this section of Ridge Pike. Proposed improvements to Ridge Pike include full depth pavement reconstruction, drainage improvements, new stormwater management facilities, new/reconstructed sidewalk and traffic signal upgrades/coordination. A new traffic signal will be installed at Crescent Avenue which currently does not have a traffic signal. New or extended turning lanes will be constructed where needed; at these locations, minor pavement widening may be needed. Ridge Pike between Norristown and Philadelphia is nearly 5 miles long and will be costly to rebuild. In order to fund and construct improvements as quickly as possible, the project is divided into four manageable segments. Each has its own timeline and funding. For more information about improvement to other segments of Ridge Pike, please visit www.ridgepikeproject.com and www.lafayettestreetproject.com. Preliminary design for this Ridge Pike (Harmon Road to Crescent Avenue) project began in late 2017 and will continue through 2019. Final design will continue through FY 2020 with construction anticipated to begin in the early 2020’s. Public Open Houses will be held periodically to help keep the community informed. Announcements will include a posting to those who have joined our email list. You can join our email list to receive project updates and announcements.